A bit of a followup from our Hive Jump editorial yesterday; where we asked the question of what was wrong with the Hive Jump Kickstarter, and what could be done to help it. 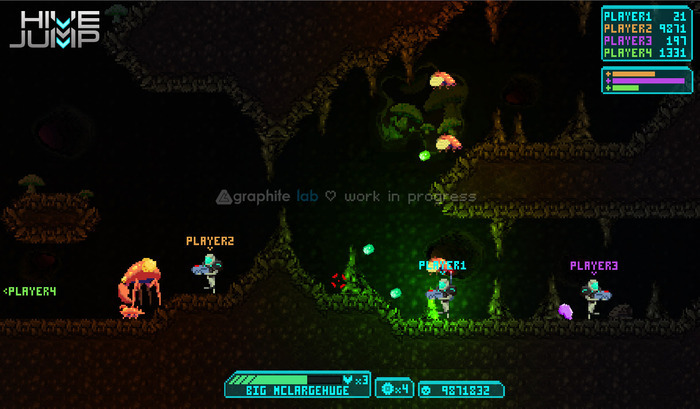 On the tails of that the developers at Graphite Labs have posted a substantial update to the Hive Jump Kickstarter; not in response to any editorials of course, it’s just coincidental timing. Those that pledge at the $30 level can give their friends a free copy of the game once it’s released. $50 level pledgers can do the same, but with the beta. There’s some impressive looking footage of the Kickstarter Funded ‘Sprite Lamp’ dynamic lighting tool being used in-game. A replay of their recent live-stream game design session. A ton of info on some of the weapons you’ll be using to fight the various underground bugs. Information on the unique weapon customization options. While the Hive Jump Kickstarter isn’t out of the woods yet, the newest information dump is a good sign, so be sure to keep an eye on it. The Hive Jump Kickstarter runs until March 15th and has a funding goal of $75,000. Previous articleWhat’s Wrong With Hive Jump?